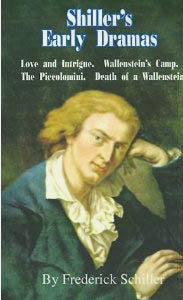 Friedrich von Schiller "Love and Intrigue"
IV-V. "The Book of Job"
Horace Walpole "The Castle of Otranto"
William Beckfor "The History of Caliph Vathek"
The preoccupations of any age tend to produce contrary reactions in a succeeding one, and the Romantic movement was an especially fierce reaction to the Enlightenment. As a literary movement, it embodied a dramatic change in prevailing habits of thinking and feeling. The Romantic poets looked inward, placing unprecedented importance on their own personal emotions, while at the same time finding exaltation in the beauties of Nature, especially in spectacular scenery. Broadly speaking, they were against the classical, the conservative and the moderate, and in favour of liberty, both political and individual, the imagination and the exotic. Like all literary movements, the Romantic movement encompassed many different tendencies and cannot easily be tied down by time or by place. It extended roughly from the last third of the 18th century to the middle of the 19th, and aspects of it are evident in every region of Western civilization. However, Rousseau, such an important influence on Romanticism, belongs to the previous generation; earlier poets such as Gray and Cowper show some Romantic elements, as do some who were active after 1850. Many writers who were at work within the Romantic period - Jane Austen for example - cannot be called Romantics, and some who do fall into that category acquired their 'Romantic' image as much from their lives and personal circumstances as from their published writings. An early example of the Romantic revival was the Sturm und Drang (Storm and Stress) movement of the 1770s, a time of great literary excitement in Germany. It was inspired by the idealism of Rousseau and its leading influence was Johann Gottfried von Herder (1744—1803), philosopher and critic, whose followers included the young Goethe and Schiller. They rebelled against literary conventions, demanded poetry of strong passions, and exalted the original genius, notably Shakespeare. The most famous work of this movement was The Sorrows of Young Werther, by Johann Wolfgang von Goethe (1749-1832), the greatest figure in German literature and a "universal man", whose work ranged over philosophy, science, music and art. This early work, in the form of an epistolary novel, and partly autobiographical, tells of a sensitive young artist, hopelessly in love with an unattainable girl, who ultimately commits suicide. It had an electric effect on Europe, becoming, something of a cult (Wertherism). Goethe was later much embarrassed by this work. 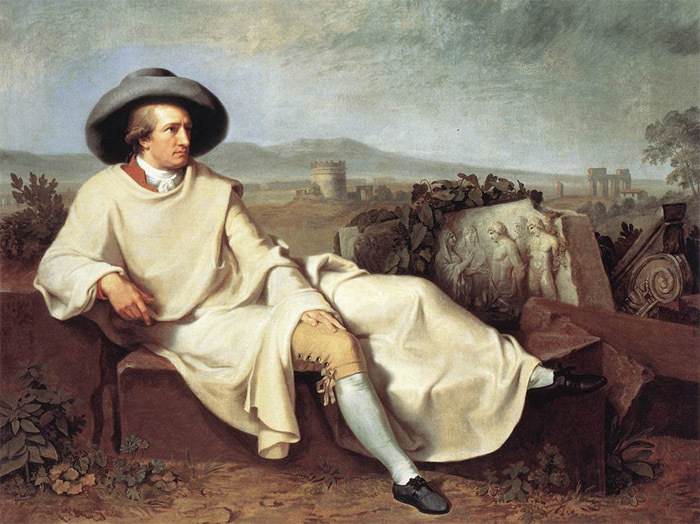 Goethe, who spent most of his life at the court of Weimar, Germain's leading centre of culture, soon outgrew the Sturm und Drang movement and, after visits to Italy, turned towards Classicism. He collaborated closely with Friedrich von Schiller (1759-1854), the great dramatist and lyric poet, in a 'golden age' of German literature (roughly 179O-1830), which integrated German Romanticism with the ancient classical tradition. 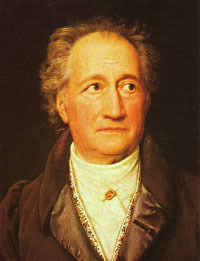 Through the advocacy of Carlyle, who portrayed him as 'the Wisest of Our Time', Goethe had an important influence on many Victorian writers. He is probably best known for his novels, and especially for his two-part drama Faust, which he began about 1770 and did not finish until shortly before his death. In the meantime, he had made great contributions to practically every field of human experience. Both German philosophy and the English Romantics had a powerful effect on a group of American intellectuals who, in the late 1830s, gathered at the house of Ralph Waldo Emerson (1803—82) in Concord, Massachusetts. 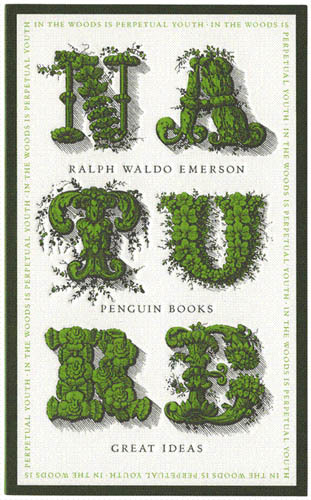 Emerson's essay Nature (1836) explained the basis of Transcendentalism, a mystical, semi-religious concept that encompassed social and economic ideas, as well as religion and philosophy. Along with self-reliance and self-knowledge, reverence for Nature was fundamental: "Nature is the incarnation of thought", said Emerson, who became a national sage in America like Goethe or Emerson's friend, Thomas Carlyle. Some of the Transcendentalists attempted to put their ideas into practice at the Brook Farm Institute, where philosophical discussion alternated with manual labour. European influences notwithstanding, Emerson advocated the independence of American culture: "We have listened too long to the courtly muses of Europe", he proclaimed in a lecture at Harvard. His essays and poems were published in The Dial, the organ of the Transcendental Club, which he edited. 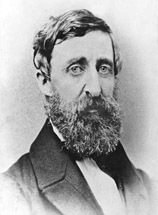 Besides Emerson himself, the most interesting and popular of the Transcendentalists was Henry David Thoreau (1817-62). Though some of his poems appeared in The Dial, he published only two books during his lifetime and depended for income on various jobs, ranging from teacher to pencil-maker. It took him, he said, six weeks to earn enough for a year's existence. His first book was A Week on the Concord and Merrimack River (1849). His masterpiece, though little noticed at the time, was Walden, or Life in the Woods (1854), the result of two years spent living in a hut he built himself on Walden Pond. Describing his experiments in self-sufficient living, the local wild life and his visitors, it also expresses his sensitivity to the pre-colonial past and, with forceful clarity, his antagonism to the materialism of the modern age. In his, often neglected, essay "Civil Disobedience" (1849), Thoreau claims the right of individuals to refuse to pay taxes on grounds of conscience. This belief, like his enactment of an Emersonian life-style at Walden, was also put into practice — his objections to the Mexican-American War and to slavery having earned him a spell in prison. Thoreau was not recognized as a literary genius, philosopher and expert naturalist until British admirers publicized his ideas towards the end of the century. His views on civil disobedience were later adopted by Gandhi, and he is now seen as a forerunner of the Green movement. give a true account of it in my next excursion." Thoreau, "Where I lived, and what I lived for". in short, like William Blake. III. "The Marriage of Heaven and Hell"
As a poet, a painter and an engraver, William Blake (1757-1827), was a highly individual genius, so strange and so uncompromising that some people thought him insane, though Wordsworth is said to have remarked that Blake's madness was more interesting than the sanity of other poets. Later generations have-seen him as a prophet, inspired by a hatred of the materialism of the 18th century; as a liberator who, for all his loathing of social injustice and oppression, saw farther, something even beyond Good and Evil; as a mystic at odds with contemporary religion, who aspired to build a new Jerusalem 'in England's green and pleasant land'. 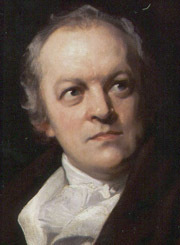 Son of a well-to-do London tradesman, Blake had no formal education but was taught by his mother and himself, learning Greek and Hebrew among other languages, and acquiring a special fascination with legend and the Middle Ages. He became an engraver and, as a student at the Royal Academy, he met painters and intellectuals, some of whom financed the publication of his Poetical Sketches in 1783. His radical sympathies later brought him into friendly contact with revolutionary sympathisers such as William Godwin and Tom Paine, who influenced his antipathy to conventional Christianity and authority. He was poor all his life, though not quite as isolated from the world, nor as deliberately perverse, as legend suggests. When he died he was buried in a pauper's grave — but he left no debts. The collection Songs of Innocence was published, together with the poet's own illustrations, in 1789. Here Blake is at his simplest and gentlest, and, for most readers, probably his most approachable. The poems are largely about childhood, some written in a deliberately child-like manner, although the declamations of the prophet can already be heard. Blake's early mysticism and love of emblems are apparent in The Book of Tirel of the same year, again with his illustrations. 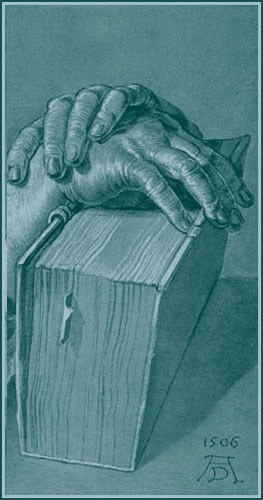 The Songs of Innocence were reissued in 1794, together with the grimmer Songs of Experience which balance the adult world of corruption and oppression against that of the innocent child, expressing with extraordinary economy Blake's highly original ideas about the connection between good and evil and his doctrine of 'contraries' - angels as devils, energy against reason. These ideas are also active in Blake's chief work in prose, The Marriage of Heaven and Hell, which consists of a series of aphorisms that overturned conventional ideas of morality. 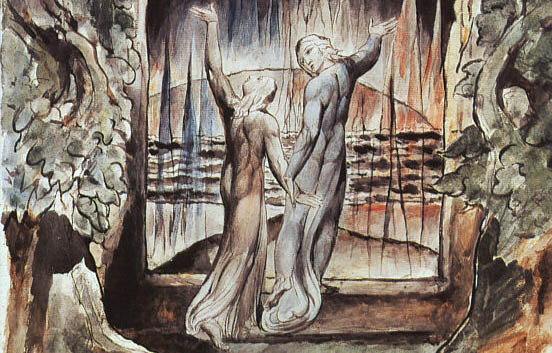 In The Visions of the Daughters of Albion (1793), America: A Prophecy (1793), and several subsequent works, Blake introduced his own mythology: Urizen, the repressive moral authority, and Ore, the archetypal rebel (like the poet himself), and other personifications, of 'body', 'passion', 'spirit', etc. These 'prophetic books' arc extremely obscure and inaccessible to ordinary readers without scholarly commentary. Blake employs what amounts to a secret language, the symbolism of which has only recently been fully worked out by devoted scholars. Blake was born within two years of Robert Burns and three years of the Suffolk poet George Crabbe (1754-1832). In spite of some common themes, a more disparate trio would be hard to imagine. Crabbe, Jane Austen's favourite poet, was a realist. He used the heroic couplet of Pope and he wrote of the ordinary experiences of rural life, without romance. His strong points in The Village (1783) and The Parish Register (1807) are his sincerity and his grimly observant eye. In spite of a very 'Romantic' addiction to opium (acquired through unwise medical advice), he knew little or nothing of the forces that manipulated the imagination of Blake, yet he is a rewarding poet who in his own day was considerably the more popular. One of his tales in The Borough (1810) concerns the tormented fisherman Peter Grimes, the subject of Benjamin Britten's well-known opera (1945 . Wordsworth, whose combative preface attacked the 'gaudy and mane phraseology of many modern writers', concentrated on the 'truth of nature' and Coleridge on the 'colours of the imagination'. Wordsworth's poems were the most personal, including 'Lines composed . . . above Tintern Abbey'. Coleridge contri­buted only four poems to the original edition, among them 'The Rime of the Ancient Mariner', one of the best-known poems in the English language. It was singled out for attack by the critics, who gave the Lyrical Ballads a mostly hostile reception. Nevertheless, a second edition, with more poems and a new preface by Wordsworth which amounted to a Romantic manifesto, appeared at the beginning of 1801, and a third edition in 1802. A lawyer's son born in Cumbria, William Wordsworth (1770-1850) is one of England's greatest lyric poets. Despite his fairly prosaic descriptions of nature, Wordsworth had an almost mystical outlook - 'we are part of all that we behold' - and the history of his mental development is to be found in The Prelude, probably his greatest work, which he began in 1798. It was published in 1805, but he revised it continually for the rest of his life. As well as a spell at St John's College, Cambridge, he spent a year (1791—92) in France — like most English Romantics, he enthusiastically supported the French Revolution, but became disillusioned later - where he had a love affair resulting in the birth of a daughter. Otherwise, Wordsworth spent most of his life in the Lake District, his presence attracting others, notably Coleridge and Southey (the 'Lake Poets'). He lived with his sister Dorothy, to whom he was devoted from childhood and on whom he was emotionally dependent. From 1799, they lived at Dove Cottage, Grasmere, now a place of literary pilgrimage, notwithstanding the poet's marriage in 1802 to a childhood friend. Although he lived a long and productive life, Wordsworth wrote most of his great poetry in a single decade, 1797—1807, after he had recovered from a period of severe mental and professional doubts, the latter ameliorated by a friend's substantial legacy. It included 'Michael', 'Resolution and Independence', his 'Ode [on] Immortality', and the 'Lucy' poems, written mostly during travel in Germany with his sister (who may have been the original Lucy), and included in the second edition of Lyrical Ballads. In his later years Wordsworth, who was Poet Laureate from 1843, politically moved steadily Right, and although he continued to write fine poetry, it lacked the fire of inspiration. Samuel Taylor Coleridge "The Rime of the Ancient Mariner"
It has been remarked that no one can write a satisfactory study of Samuel Taylor Coleridge (1772-1834) because no one has a brain large enough to encompass the vast range of his intellectual and artistic interests. Coleridge was Wordsworth's chief intellectual stimulus, as Dorothy was his emotional prop. Son of a Devon vicar, like Wordsworth he did not stay long enough at Cambridge to take a degree. 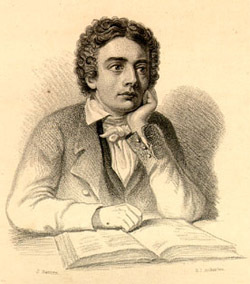 His first poems appeared in a newspaper in P94, when he settled in Bristol, lodging with his friend, the poet Robert Southey, lecturing on politics, religion and education, and marry­ing the sister of Southey's fiancee. He produced a radical weekly publication, started a family and began his study of German liter­ature, also acquiring the habit of taking opium against depression. Moving to Somerset, he met the Wordsworths in 1797, the start of a literary partnership that produced the foundation of English Romanticism, the Lyrical Ballads. An annuity from a rich pottery family, the Wedgwoods, alleviated his financial problems, and he produced a succession of poems, including the strange, magical, fragmentary, opium-induced 'Kubla Khan'. In 1798 he visited Germany with the Wordsworths, confirming Coleridge as the spokesman on German Romanticism. He moved to the Lake District in P99 to be near the Wordsworths, and fell in love with Mrs Wordsworth's sister, a cause of profound personal anguish, manifested in a series of poems m 1800—02 and in virtual addiction to opium. In 1808 he began lecturing .it the Royal Institute, notably on Shakespeare. Crisis came in 1810, caused by a breach with Wordsworth (later healed, though never completely), and feelings of desperation induced chiefly by his relationship with Wordsworth's sister-in-law. As a poet, his career was closing, but as a philosopher and critic he still had fruitful vears ahead. (The coarser pleasures of my boyish days. The mountain, and the deep and gloomy wood. The idea of the Romantic hero as a beautiful young man of turbulent emotions, passionate, devoted to liberty, widely travelled, and destined for a premature death was personified in the leading members of the second generation of English Romantic poets, Byron, Keats and Shelley. 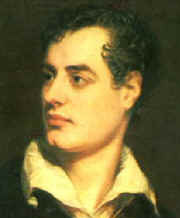 All of them, but Byron especially, have become almost as famous for their lives, loves and letters as for their poetry. George Gordon, 6th Lord Byron (1788-1824) inherited Newstead Abbey, but little money, and gained a reputation as a wild young man at Cambridge. His earliest poems were highly sensual, and he destroyed most copies. He responded to early criticism with sharp satire, attacking Scott and the Lake poets, though he later recanted. After a long tour of the Mediterranean, vividly described in letters, he wrote the first two cantos of Cbilde Harold's Pilgrimage (1812), the wanderings of a young man in various settings, partly autobiographical, which made him famous. As a handsome young aristocrat, he was also fashionable, until the break-up of his unsuitable marriage (1815) turned public opinion against him. He left England for ever in 1816, stayed in Switzerland with the Shelleys while writing the third canto of Cbilde Harold and had a daughter by Mary Shelley's sister. In the next two years he produced some of his best work, including Manfred and the first cantos of Don Juan. He was now a famous figure throughout Europe: a character in Goethe's Faust is based on him. He was closely involved with the Italian nationalist movement until 1821, when he threw himself into the cause of Greek independence. He died in Greece, his heart being buried in Athens. 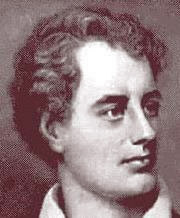 In his public quarrel with Southey, Byron gave Romanticism a new and more combative image. Literary critics now rank him just below the great poets, and regard Don Juan, an 'epic satire' (16 cantos, but unfinished, in ottava rima) as his masterpiece. More radical than Byron, Percy Bysshe Shelley (1792—1822) regarded poetry and politics as one. Called 'Mad Shelley' at Eton, he was expelled from Oxford for his public espousal of atheism. Eloping with 16-year-old Harriet Westbrook lost him his family inheritance, and his ultra-democratic views attracted the attention of the secret service. William Godwin, the anarchistic philosopher, was for a time his mentor and in 1814 he eloped with Mary, Godwin's daughter by the feminist pioneer Mary Wollstonecraft. He married her after Harriet's suicide in 1816. Always a wanderer, Shelley spent the summer of 1816 at Lake Geneva with Byron and from 1818 lived in Italy. There he entered his poetically most creative period: the dramas "Prometheus Unbound" and The Cenci; the great political poem 'The Mask of Anarchy', inspired by the Peterloo Massacre; and some of his most famous short poems, such as the 'Ode to the West Wind' (written in a few hours), 'To a Skylark', 'The Cloud' and Adonais an elegy for Keats (1821). In 1822 Shelley was drowned in a boating accident at La Spezia. 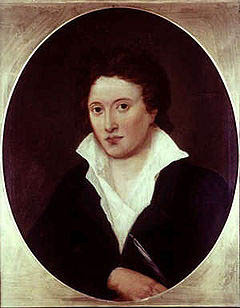 Shelley is regarded as one of the finest lyric poets in the language, though for a time he was comparatively little read. His high reputation among critics today arises largely from his revolutionary thoughts and ideas, which studies have shown to be wider-ranging, more profound, also more ambiguous, than Shelley's contemporaries realized. is now preserved in spirits of wine". 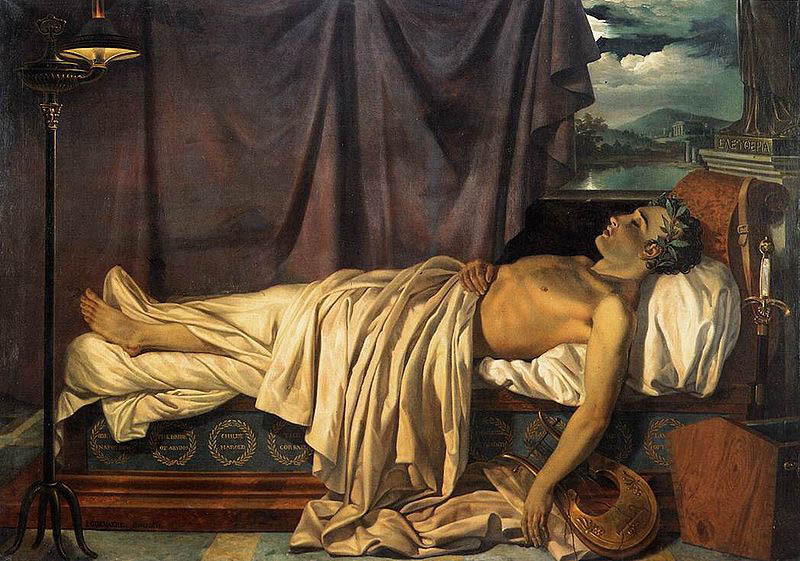 The popular image of John Keats (1795-1821) as the ultra-sensitive, tormented, young Romantic artist 'half in love with easeful Death', applies, if at all, to his last, death-threatened years. At school he was remembered for his love of sports before his appetite for reading. Keats is, with Wordsworth, the most popular of the English Romantics, and one or two of his odes ('To Autumn', 'On a Grecian Urn', 'To Psyche', 'To a Nightingale') are as famous as any English poetry outside Shakespeare. He came from a poor, devoted family that was riven by tuberculosis, and trained, but never practised, as a surgeon. His early work, including the sonnet 'On First Looking into Chapman's Homer' (1816), received little attention, while his letters, now a major reason for his fame, were not published until after his death. At Hampstead in 1817 he wrote his most ambitious work so far, Endymion, in friendly rivalry with Shelley, currently working on a comparable work (The Revolt of Islam). Despite mutual admiration, Keats kept his distance from Shelley's more powerful personality. Hyperion (begun in 1818) reflected Keats's travels in the north and west, although mainly written in Hampstead, where he had fallen in love with Fanny Brawne. There followed 'The Eve of St Agnes', a wonderful montage of Romantic medievalism; his finest odes; the sonnet on 'Fame'; and the ballad 'La Belle Dame Sans Merci'. By early 1820 he was seriously ill with tuberculosis. He went to Italy, avoiding Shelley's circle at Pisa, in a bid for recovery, but died in Rome. His reputation rose steadily after his death and has never declined. 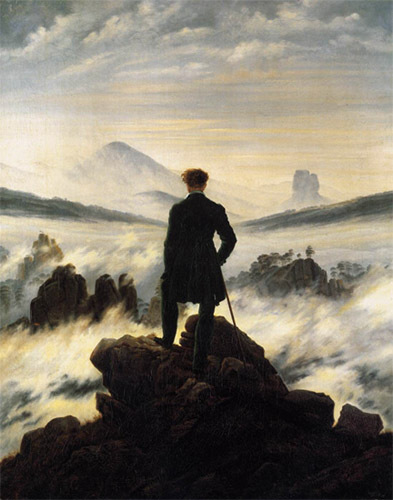 As a literary movement, Romanticism was essentially poetic, but it was also a period in which a new kind of prose developed. One aspect of the movement was an intense interest in the inner or private life of the individual, which found expression in the popularity of letters, memoirs and biographies. Autobiography, partly through the inspiration of the Romantic poets, became a literary genre for the first time. Criticism gained psychologi­cal depth; essayists discussed the fantastic, the process of creativity and the inadequacy of Reason and Classicism. They embraced new subject matter, including science and technolo­gy, or treated familiar subjects in a novel way. Perhaps the most original and capacious mind of the Romantic era, Coleridge brought a subtler, more philosophical interpretation to literary criticism, both in his lectures and in works such as Biographia Litemria (1817), a massive if ill-organized work on 'literary life and opinions'. It contained practical advice to potential writers, but was fundamentally concerned with the meaning of 'imagination', and included studies of then little-known German writers, memorable reconsiderations of Shakespeare, and essays on the psychology of the creative process. Though a precocious youth, William Hazlitt (1778-1830) was nearly 30 before he concluded that he was intended for a life of letters, having spent much of his early years painting. The freshness of his style owed something to the early Romantics, though he later quarrelled with them on political and literary grounds. His vigour sprang from the intensity of his radical but idiosyncratic opinions, whether on great events such as the French Revolution, or on humbler matters such as mail-coach travel. Hazlitt's early works dealt with philosophical questions, but his true metier was as a critic and essayist, and he is almost unique in English literature m establishing so high a reputation entirely on such writings. Of his many volumes of essays, perhaps the best are Characters in Shakespeare, dedicated to Charles Lamb and much admired by Keats, Lectures on the English Comic Writers, and especially The Spirit of the Age (1825), containing critical portraits of many contemporaries. Thomas De Quincey (1785-1859) is chiefly remembered for "Confessions of an English Opium-Eater" (1821), which first appeared in the London Magazine. He was devoted to the Wordsworths and took over Dove Cottage his opium addiction and his Recollections of the . . . Lake Poets (18.34-39). From 1826, with a family to support, lie wrote extensively for Blackwood's, including 'On Murder Considered as One of the Fine Arts' (1827, 1839), a minor masterpiece of black humour. As a stylist, he lacked Hazlitt's sparkle, adopting an original, if rather laboured, 'poetical' style to describe his opium-induced dreams. A breezy contrast with the Romantics is presented by Thomas Cobbett (1763-1835), a democrat, patriot and powerful advocate of parliamentary reform. The kind of 'sublime' scenery that inspired the Romantics would have been roundly condemned by Cobbett for its barrenness - he liked to see a good field of turnips. A voluminous writer, with the knack of engaging the reader's sympathy with his strongly expressed views, he is remembered chiefly for his classic Rural Rides (1830, 1853;, a collection of accounts of his exploration of the English counties on horseback. 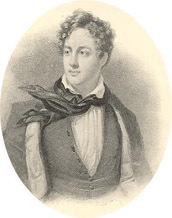 The Essays of Elia (1823, 1833) are responsible for the affection in which Charles Lamb (1775— 1834) has been held. They are largely 'blithe trivialities' (e.g. 'A Dissertation upon Roast Pig'), and the smiling, sentimental face that Elia presents reflects the kindly character of Lamb, who had a large circle of literary friends, maintaining lifelong friendships with Coleridge and Hazlitt. A sharper, though genial, wit was the Revd Sydney Smith (1771 —1845), a born satirist whose articles published in The Edinburgh Review, one of the first and weightiest of the political-liter­ary journals founded in the early 19th century, were often denoted to mocking the Romantics. Lamb's circle did not include the notoriously short-tempered Walter Savage Landor (1775-1864), who spent most of his adult life abroad. A man of great learning and fine critical perceptions, Landor's prose is distinctive, sometimes beautiful, and outside the mainstream, though his poetry is largely forgotten. He was much admired in the 19th century, not least by Browning, who looked after the angry old man in his last years in Florence. An offshoot of Romanticism was the Gothic novel, inhabiting a literary underworld that has remained signif­icant ever since and is currently manifest in innumerable science-fiction fantasies and tales of horror set in American suburbs. In fact it precedes the Romantic movement, dating from the mid-18th century. The word Gothic in the later 18th century came to mean wild and undisciplined, even crude - the antithesis of Classicism. Gothic novels were frequently set in the Middle Ages (a taste not confined to literature), in castles, monasteries and dungeons, and the plot depended on suspense and fantasy, frequently with a supernatural element. Horace Walpole (1717—97), son of the so-called 'First Prime Minister', was in many respects a quintessential 18th-century man of letters. He had a brilliant mind, no need to earn a living, no strong convictions, and much of his time was taken up with social matters: he had a large acquaintance and was a prolific corre­spondent. He also had a distaste, ahead of the Romantics, for commercialism and the rule of Reason and, prior to the Pre-Raphaelites, a love of medieval culture, or at least his notion of that culture. The tangible memorial of this predilection is his jewel-like 'medieval' villa, Strawberry Hill, near Twickenham, where the bookcases were modelled on the altar screen at Chartres. 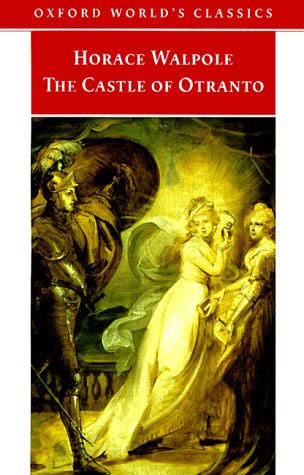 Walpole's The Castle of Otratito (1765) is generally cited as the first 'Gothic' novel. It is a medieval daydream, set in Italy, full of mysterious terrors and supernatural menace. It was a great popular success, which perhaps misled the cultured Walpole into supposing he had composed a work of art. 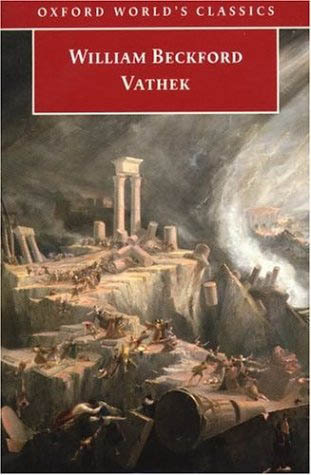 William Beckford (1759-1844), a million­aire, wrote Vathek (1786), set in the mysterious and fantastic Orient, full of strange and cruel passions, the sort of book whose author would now be suspected of harbouring deviant and anti-social desires, as indeed Beckford seems to have done. Ann Radcliffe "The Mysteries of Udolpho"
The best-known later exponents of the fin-de-siecle 'terror tale' were Mrs Ann Radcliffe (1764-1823) and Matthew Gregory Lewis (1775—1818), generally known as 'Monk' Lewis after his most famous book The Monk, a debased version of Faust. The most popular of Mrs Radcliffe's five novels is The Mysteries of Udolpho (1794), a fairly typical example of the genre: the innocent young heroine falls into the hands of Montoni, the cruel and allpowerful proprietor of a grim, remote and haunted castle. Eventually the supernatural elements turn out to have a rational explanation. Novels such as these were extremely popular among readers at the circulating libraries, where books could be borrowed for a small fee, a major stimulus to fiction writing in the late 18th and 19th centuries. The Gothic novel had some effect on better writers, including Byron and Shelley. In Northanger Abbey, probably written about 1798-1800, Jane Austen mocked the genre by contrasting it with real life. Shelley's friend Thomas Love Peacock (1785-1866) exploited aspects of the genre in his satires of Romantic excesses. The Brontes, on their Yorkshire moor, certainly read Gothic novels: Charlotte Bronte's Rochester (in Jane Eyre) has been called a middle-class Montoni, and Emily's Wuthering Heights provides further evidence. The supernatural and macabre tales of the Romantic era are today almost completely unread, with one most notable exception: Frankenstein, or the Modern Prometheus (1818) by Mary Shelley (1797-1851). It certain­ly transcends the genre, though whether it can bear all the critical weight that has been loaded on it is another question. Mary Shelley said that the idea came to her in a half-dreaming state, arising from a light-hearted agreement with Shelley and Byron in Switzerland in 1816 that each should write a story of the supernat­ural. The others never completed theirs. She adopted the epistolary form, technically perhaps something of an advantage with this type of subject matter. Frankenstein, a well-meaning philosopher-scientist, discovers how to create life arti­ficially in a creature he assembles from spare parts of corpses. The result is a monster, hideous in appearance and superhuman in strength, who horrifies all normal human beings, and having acquired human emotions through its reading of Milton, Goethe and so on, turns murderous when Frankenstein breaks his promise to provide him with a mate. Frankenstein pursues it to the Arctic, meeting the British explorer whose letters tell the story, and dies. The monster disappears into the frozen wastes, seeking its own death. Besides being a pioneer work of science fiction, Frankenstein is also a variation on the theme of the Rousseauesque 'Noble Savage', a good creature ruined by 'civilized' society. It has inspired a legion of films, most of them failing, or not attempting, to capture the resonances of the story. 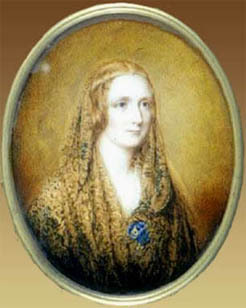 After Shelley's death, Mary settled in England and later wrote a number of other novels, one [The Last Man, 1826) set in the future, but none has the power and vision of Frankenstein. The historical novel, meaning one dealing with a time before the author's birth, was not invented by Sir Walter Scott. An early example was the Comtesse de La Fayette's La Princesse de Cleves and many 18th century Gothic novels were set in earlier times. Castle Rackrent (1800) by the Irish writer Maria Edgeworth, a pioneer of both the historical and the regional novel, was acknowledged as an influence by Scott, always a man to pay his debts. Still, Waverley (1814) first made the historical novel widely popular and established it permanently, not only in Britain, but throughout Europe. So far, the revisionists have hardly dented Scott's reputation as one of the most attractive and honourable people ever to publish a work of fiction. In his day he was hugely popular, but now he is little read. He trained at Edinburgh University as a lawyer, and acquired a profound knowledge of country folk and legends, travelling on horseback around Scotland on legal business. He was a poet first, and became famous after The Lay of the Last Minstrel (1805), the first of several verse romances. The most notable are The Lady of the Lake and Marmion (1808), about the Battle of Flodden. Scott's industry and output amazed even his contemporaries, for he was also involved with a vast range of other literary work and public duties. Yet visitors to Abbotsford gained an impression of a lairdly if not leisurely existence, as if novel writing was a pastime undertaken on idle evenings. Such was Scott's output that it was suggested he must have written many of his novels much earlier, and merely produced them from a drawer on demand. Except for Waverley, started and abandoned several years before it was published, this was true only in the sense that much of Scott's material had long been stored away m his mind. Overwork was responsible for serious physical ailments in 1817-19, and the frenetic activity of his last years, when he might have taken refuge in bankruptcy, but honourably insisted on working to pay his debts, led to his final illness and death. All creditors were paid in full. The success of Waverley, which sold out four editions in its first year, turned Scott permanently from poetry to fiction. 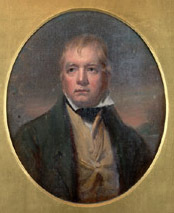 It was published anonymously: all Scott's later novels bore the phrase, 'by the author of Waverley', and he did not publicly admit authorship until 1827. It concerns a young, romantic army officer at the time of the rebellion of 1745 who is attracted to the Jacobite cause. The novels thereafter came thick (literally, for they are immensely long) and fast. The majority, and on the whole the best (Old Mortality, The Heart of Midlothian, Rob Roy, Red Gauntlet), were also set in the Scotland of the recent past. Those set in the Middle Ages (Ivanhoe, The Talisman) lack some of the vigour and conviction of the Scottish novels, although Kenilworth, set in 16th—17th century England, and Quentin Durward, set in 15th-century France, albeit with many Scottish characters, have been especially popular. Scott's most obvious contribution to the development of the novel was the addition of background. Fielding and Jane Austen created characters within a restricted environment, but Scott presents a great social panorama, with picturesque details drawn from his unrivalled knowledge and fertile imagination as well as fine descriptions of landscape and nature (ironically, a factor that probably alienates the impatient modern reader). In his rich array of characters, Scott surpasses Dickens, though, like Dickens, it may be said against him that psychologically, his characters are relatively superficial, their feelings and motives simple. Scott was by nature perhaps too easy-going to deal with real tragedy, or with spiritual agony, and religion meant little to him. It has often been pointed out that his picture of the Middle Ages virtually omits the period's most powerful social institution, the Church. Modern historians can also criticize Scott on facts, but for good or ill, the popular - not to say romantic and superficial - image of Scottish history, perhaps even in Scotland, derives more from Scott than from the output of the historians. That mantle has, it seems, been inherited by Hollywood, which in turn colours our idea of Scott. He was certainly a great story teller, but he was also a serious writer with a deep concern for history and society. Scott, The Lady of the Lake (1810), Canto VI.